Email is — and remains — a pillar of modern collaboration. 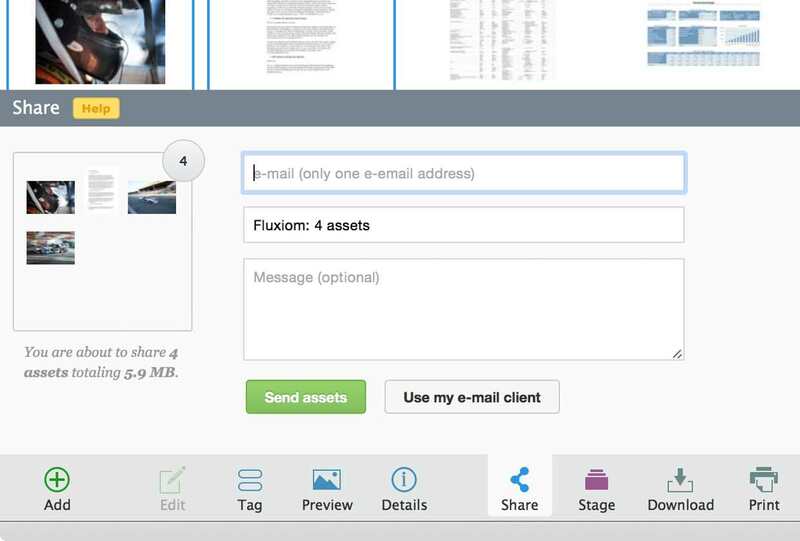 This is why Fluxiom has always made it easy to mail assets to the recipients of your choice. Today, we are introducing important refinements to this classic feature. Only 0.8% of Fluxiom users have ever shared their files inline. Given the many arbitrary limitations placed on attachments, and the vagaries of corporate SPAM filters, this is hardly surprising. Therefore, we are retiring this particular option, in favour of linking securely to your files. Attachment-free emails are smaller, and travel much faster: a win for both parties. Fluxiom is all set to email links on your behalf, complete with custom comments. However, if you prefer to send the message from your own email client, you can opt to open a filled-in draft in your local application of choice. This allows you to edit, send, and archive your message as you would any other. Because there are now two options, we now display two buttons: one green, for Fluxiom, one grey, for local email. Gone are the long radio buttons — they shan’t be missed. To access the freshly redesigned sharing pane, simply select your assets, and click on the blue Share icon in the bottom toolbar. The team remains hard at work to ensure optimum delivery times for all your emails, in both the front- and back-ends. We hope this cleaner, simpler interface helps you shave precious seconds off your workflow, and look forward — as always — to reading your feedback. We are proud to announce two small improvements to Fluxiom’s invoicing settings. 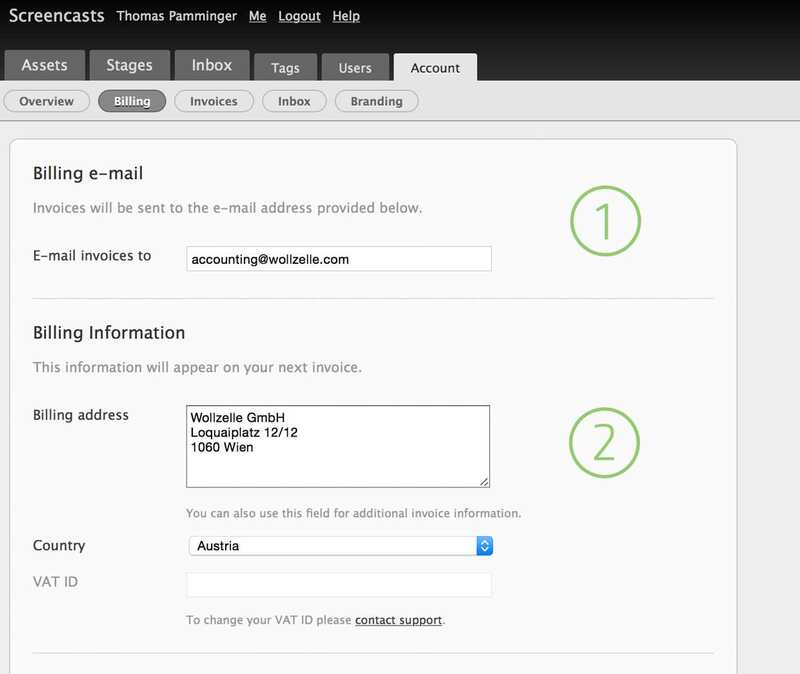 1) Invoices can now be sent to a dedicated email address. It used to be that the Fluxiom Account Holder necessarily received all invoices. From now on, you can enter a separate email address for invoices only. This enables you to send all invoices directly to your accountant, while you focus on managing the application and running your team. 2) The address field is now flexible. The small and rigid address fields have been replaced by a free-form text area. This allows you to enter more complex addresses, including building names and suite numbers. You can also use this field to enter any information you need to appear on the invoice, such as project identifiers or company registration numbers. Both new features are entirely optional, and existing account holders need not change anything unless they expressly want to. Should you want to avail yourself of the new options, simply log into Fluxiom, and click on the “Account” tab. We look forward to hearing your feedback while we work on further refinements to the interface. Let us know how the new invoicing features fit your workflow, and how we can improve further. Better Tags management, improved search, and a refreshed interface have come to Fluxiom today. We are committed to making Fluxiom the best it can be, which includes sanding away any rough edges that could slow you down. The changes we are making today do not fundamentally alter the functionality of the application but should shave precious seconds off even simple workflows. Small improvements have been made to the interface, across the application, amongst which a fresh new selection colour for both Assets and Tags. Icons have been refined further still, both to enhance Retina compatibility and to communicate complex meanings more efficiently. Tags are now managed from their own Tab. To add, delete, or rename Tags, simply click on the Tags tab at the top of the interface. Tags are more often accessed than managed, and separating usage from administration will help clarify both sides of the feature. You can now trigger a Full Text Search by depressing the new Full Text Search button, located right next to the Search Field. It used to be that Full Text Search was only available as a secondary step, after the completion of a regular Search operation. This button puts both flavours of Search on an equal footing. Small improvements have been made to the interface, across the application. These include a new and more consistent selection colour for Assets and Tags, refreshed icons, and enhanced compatibility with Retina displays. You would be right to think that Fluxiom is on a roll. We are investing significant resources into a programme of continuous functional improvements. The stability and security of the platform remain our primary concerns, but we believe this steady stream of enhancements will keep Fluxiom at the top of its game. As always, feel free to get in touch. Your comments and feedback are always welcome. If you keep an eye on computing news, you have no doubt heard about POODLE. If you haven’t, suffice it to say that it is a security vulnerability that can, in the right circumstances, lead to the disclosure of information that was thought to be transmitted securely across the Internet. In the very worst case scenario, this could leak sensitive data, and allow a malicious user to highjack an authenticated session. The good news is that you are already safe, and fully protected against POODLE when using Fluxiom. No action is required on your part. If you are interested in the details, please read on. Was Fluxiom affected by POODLE? POODLE is an attack against the SSL 3 protocol. It is not a vulnerability in any particular application. As such, Fluxiom was indeed theoretically vulnerable to POODLE, much like the very vast majority of sites around the Internet. However, because POODLE was disclosed responsibly, because we reacted swiftly, and because POODLE requires the attacker to operate from a privileged network position, we have every reason to believe that it never posed a practical threat to Fluxiom customers. We say this from our usual standpoint of informed paranoia. Am I safe from POODLE on Fluxiom? Emphatically yes. Support for SSL 3 has been disabled across the board on our servers. This means you are totally safe from POODLE while using Fluxiom. When it comes to Fluxiom, nothing. Continue practicing good password hygiene, refrain from connecting to your account on public computers, and exercise care on public networks. Same old, same old. Generally speaking, keep an eye out for software updates. A lot of them. Vendors are poised to release patches for browsers and operating systems in the coming days. While you are safe on Fluxiom.com, keeping your software up-to-date across the board is the only way to ensure your continued safety online. This blog post suggests workarounds for users who wish to heighten their degree of protection, pending official updates from vendors. Should you have any questions about the security of your data on Fluxiom, please get in touch. We are committed to the safety and security of your data, and are always happy to hear from you. Digital asset management may be the way of the future, but the humble sheet of paper remains surprisingly useful. Cheap, unbreakable, and infinitely expandable, it is ideal for early drafts, quick reviews, and ad-hoc shares. This is why contact sheets remain in heavy use in ateliers, design studios, and magazines around the world. Today, we’re making it extra-easy — and extra-useful — to jump from Fluxiom to paper, by introducing Contact Sheet Printing, a new feature that does just what you would expect, beautifully. Select your files, and click on the Print button. (You’ll find it in the bottom Toolbar). A window will pop up, allowing you to confirm your selection, and tweak the number of columns. 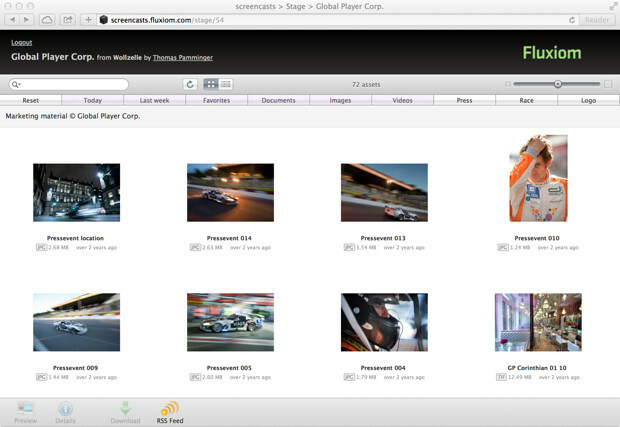 A click on the green Print button is then all it takes for the contact sheets to emerge from your printer. Go offline, not backwards: the full power of Fluxiom is available to you, as you select images to print. You can click on thumbnails, filter by tags, highlight results from a search, and even open a Stage. It all works, and you can organise your sheets by client, date, mood, process, theme, etc. 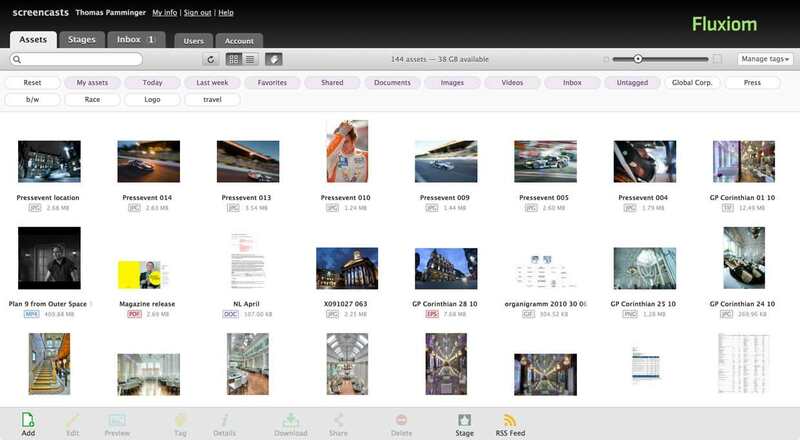 While simple on the surface, this new feature has been optimised to answer the needs of professional photographers, across paper sizes, printer types, and workflow habits. We hope it is as useful to you as we strived to make it, and we look forward — as ever — to hearing your feedback. The more you use Fluxiom, the better it gets. Today, we are introducing two small updates, to help you work in greater comfort. With so much happening in computing news at the moment, we’re holding off on bigger changes, but this round of improvements should fit right into your existing workflow. Tags have been key to the Fluxiom experience from the start. They are displayed prominently above the file picker for quick, convenient access to your documents. As your collections grow, so does your Tag Bar. Yet, on today’s smaller screens, it no longer makes sense to keep a long list of tags in full view at all times. The new Tag Bar toggle allows you to hide or show the Tag Bar at the click of a button. Click to see, un-click to un-see: this is all there is to it: a small button makes a big difference. Focus on files, focus on tags: the choice is now yours. We’ve updated our icons, switches, and boxes for greater visual consistency. You’ll notice a cleaner, slightly flatter look, as well as subtler colours, to better complement your content. And yes, Fluxiom is now Retina-optimised all the way through! It will look gorgeous on any device, including the brand new Retina HD iPhone 6 Plus. It’s the Fluxiom you know and love, all grown up. Muscle-memory friendly: our fresh new icons won’t confuse you. Consistent Tag « bubbles » pave the way for a better, richer Fluxiom. As widely reported, an exploit known as OpenSSL HeartBleed CVE was discovered on April 7th. An attacker who exploits the heartbleed vulnerability would have access to the contents of server memory, which means private information could be extracted. Although it was just found, the bug has been around for more than two years, which means a lot of sites that we all use every day may have been affected. About two-thirds of Web servers rely on OpenSSL. The Fluxiom application servers were not affected by the Internet security threat Heartbleed. Only our servers responsible for the initial signup were potential targets so we’ve immediately patched the servers and re-keyed and installed new SSL certificates. This closed the vulnerability of the signup servers. 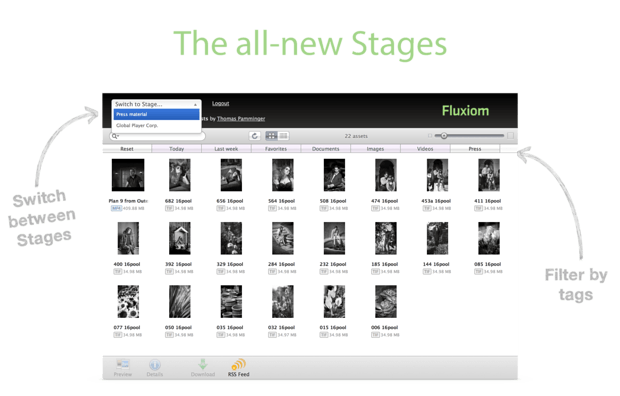 Fluxiom has been designed to help large teams share large files with large groups of people, and our secure Stages are central to this mission. Many of you have created dozens of Stages, and handed out hundreds of accounts to trusted clients and partners. Today, we are delighted to introduce three key upgrades to the Stages login system. They have been designed with scaling in mind, and will greatly facilitate account management, for both administrators and end-users. Each Stage previously came with its own login page, and set of credentials. This means users could be required to authenticate multiple times on multiple pages, to view all the files they had been granted access to, across all their Stages. They will now be able to log in from a central location, and access all the Stages you have shared with them, through an in-app drop-down menu. 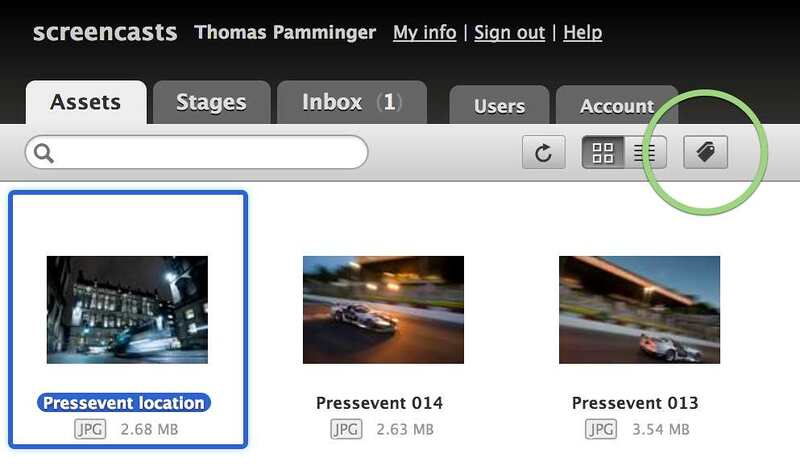 Users can access all the Stages you have shared with them, through a drop-down menu at the top left of the screen. Users were previously handed one password per Stage, even if the Stages they had been granted access to were published by the same Fluxiom account, and were shared with the same email address. From now on, they will be given an opportunity to set up one single password of their own, which will work on all the Stages they have been invited to join. Once logged in, they will be able to switch between Stages, without needing to re-authenticate. Stage passwords, known in Fluxiom parlance as Magic Phrases, were previously fixed, and randomly generated by the application. Resetting them required that the administrator took manual action. Stage users will now be able to follow the standard Fluxiom password reset process, should they ever forget theirs. They will also be able to change their automatically generated password to the string of their choice. Users who have only been invited to a single Stage will be transparently redirected to the new unified login page, where their existing credentials will continue to work. They will be able to update these credentials, but will not be required to do so. If they do not want anything to change, then nothing will, at least on the surface. Users who have been invited to multiple Stages will also be transparently redirected to the new unified login page. Upon entering their email, and any one of their existing passwords, they will be sent an email containing a link to create a new password of their own. From then on, this new password will unlock all the Stages they have access to. This will happen the next time they log into Fluxiom, and no unexpected emails will be sent until then. The entire upgrade process will be as easy and painless as resetting a password on a regular web application. Together with the recent addition of a Tag Bar in Stages, these dramatic improvements to the authentication system will greatly streamline the workflow of teams who rely on Stages to communicate with external partners. In addition to the convenience and security boost it provides, this user management overhaul paves the way for an even simpler, smoother Fluxiom — but that is a story for another day. Tags are a key ingredient in the Fluxiom formula. Tagging files makes it easy to drill right down to the documents you are looking for, no matter how large your account, and how advanced your criteria. And we all know how convenient Stages are, when it comes to sharing your files securely with clients and partners. Yet, until today, Stages did not reflect the various tags you had assigned to the documents they contained. While it was not a big issue for smaller Stages, it could occasionally make files more difficult to find than they could — and should — have been. Today, we are happy to announce that this limitation is no more. All the tags that have been assigned to the documents you put in a Stage will be displayed in a Stage-wide Tag Bar. This bar behaves just like the Tag Bar that already appears in your Fluxiom account. It will also feel instantly familiar to anybody who has ever used labels to manage their email, or tags on OS X. This new feature does not change the way Stages work. There is no new interface to learn, and nothing to update in your existing Stages. 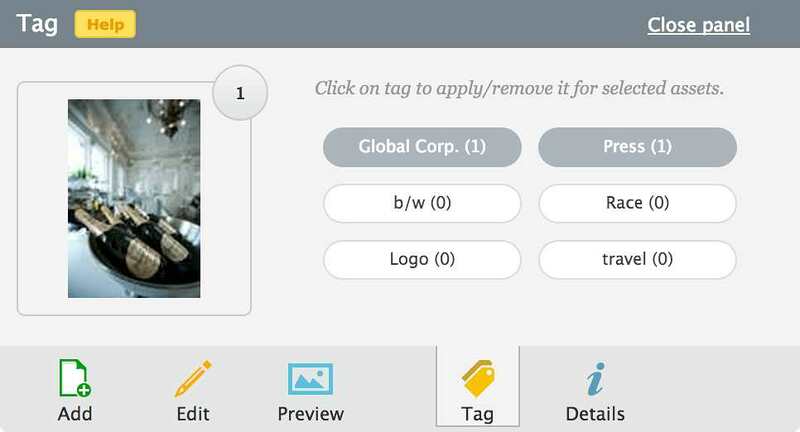 Do note that because the tags you selected to create the Stage in the first place are assigned to all the documents your users have access to, they will not appear in the Tag Bar. 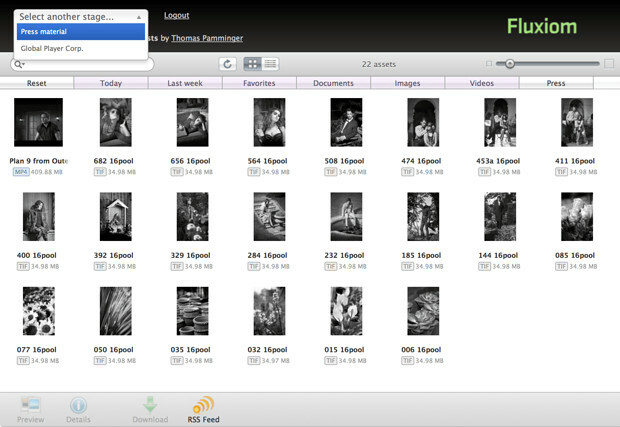 If there are no other tags in the Stage, the bar will simply display Fluxiom’s helpful built-in tags, such as « Images », « Today », etc. 1.700 Stages on Fluxiom currently host nearly 1.000.000 documents, and we think this small but significant update will tremendously boost their usability. As the system keeps growing, we will keep looking for ways to make retrieving and sharing your data even easier. As always, your comments and feedback are welcome on Stages. We look forward to hearing what you would like to see next in Fluxiom, and will have one more thing to share in the coming days.